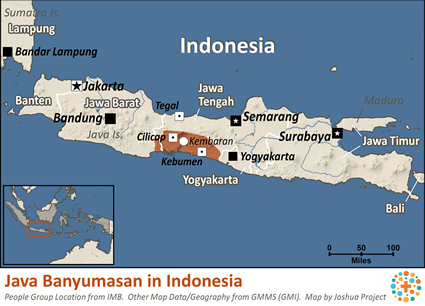 The Jawa Banyumasan live in the southwest part of the province of Central Java, specifically in the regencies of Cilacap, Kebumen, Purworejo, Purbalingga, Banjarnegara and Banyumas. The Jawa Banyumasan is one of the subgroups of the Jawa people groups, but they have their own cultural variations which differ from other Jawa peoples. The Jawa Banyumasan are often called the Jawa Mendhoan or Jawa Serayu. They are called this because one of their best-known foods is mendhoan tempe. This is prepared from tempe (fermented soybean cake) dipped in spiced batter and then fried until half-cooked. The name Serayu is sometimes used because the Serayu river runs through most of their area. They speak the Banyumasan dialect of the Jawa language. It is relatively easy for the Jawa Banyumasan to understand conversations in most other Jawa dialects. Javanese speech levels are like a family tree. The higher you go the more similarity/standardization there is. But the lower you go the more variety. Ngoko is the lowest level and that is where all the variety is. However, other Jawa groups find it difficult to understand the Banyumasan dialect due to the widespread use of specific Banyumasan vocabulary. Their use of 'a' rather than 'o' enables them to learn the national Indonesian language more quickly than other Jawa subgroups. 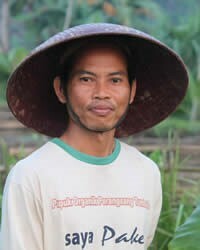 Most of the Jawa Banyumasan people make their living from farming, but compared to other Indonesian people groups, they are fairly advanced in this field. Besides having fertile land, they use the land well, even more so now that they have modern equipment. The industrial sector is also experiencing rapid growth. An example of this is the development of Cilacap as an industrial city. Besides heavy industry, small industries are also growing well. Woven bamboo and brown sugar products are a mainstay of small industry. In addition to fulfilling the needs of the Jawa Banyumasan themselves, these commodities are sold in other areas. The majority of the Jawa Banyumasan are Muslim. However, 80% of them are nominal Muslims (abangan). The other 20% are serious Muslims (santri) who strictly follow Islamic teachings and are faithful in worship. In addition, some Jawa Banyumasan also follow animistic beliefs. They believe there are spirits that come from the unseen world. For example, they believe in spirits such as bujungan (shrouded ghosts, shaped like a corpse in burial cloth); jangkrong (shaped like a human skull); and dhemit (spirits that live at shrines). Places that are often considered sacred include graves, mountains, caves and seas. Some of the Jawa Banyumasan still seek help from a dukun (shaman/healer/occultist) if they are sick or bothered by spirits. They often hold ceremonial meals (selamatan) or ritual feasts (kenduri), which include use of mantras and offerings to spirits. The purpose is to protect their area from calamity. The Jawa Banyumasan people still need assistance to increase their agricultural production. They need more dams and a better irrigation system could help them harvest more than three times as much per year. The opening of more work opportunities could decrease migration of youth to Cilacap and other cities. Development of new industry is still needed outside the city of Cilacap. View Java Banyumasan in all countries. Location in Country: Widespread throughout Indonesia; mainly in Jawa Tengah, Yogyakarta, Jawa Timur, and Lampung provinces; scattered enclaves on Sumatra island and resettlements in Papua, Sulawesi, Maluku, and Kalimantan.